Sealladh A’ Chaolais is a two bedroom (sleeps 4) self catering cottage in the beautiful Island of Eriskay in the Outer Hebrides. The cottage is on one level with a double room, twin room, main bathroom with walk in shower, lounge and kitchen / dining area. 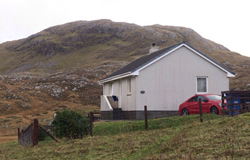 Located just off the causeway that connects Eriskay to South Uist you will be taken in by the stunning sea and hill views the cottage has to offer. With a short walking distance to the Co Chomunn Erisgeidh, A M Politician pub which serves great meals and the beautiful beaches -including Prince Charlie Bay. Ideal base to explore the neighbouring islands with a short drive to the ferry terminal for the ferry to Barr or over the causeway to South Uist to explore Benbecula, North Uist or catch the ferry to visit Harris for the day. You can explore the islands stunning scenery or relax and unwind.